The development of SATRA’s STM 567 Endofoot machine, and associated test methods used to determine comfort. The SATRA STM 567 Endofoot test machine has established an impressive track record for the determination of two important footwear characteristics associated with foot comfort: the footwear’s thermal performance and the efficiency of sweat (perspiration) management within the footwear. This industry-leading test machine and its associated SATRA test methods allow both of these characteristics to be assessed for whole footwear. Footwear manufacturers may provide too little or two much thermal insulation for the application intended. How should the correct amount be determined? 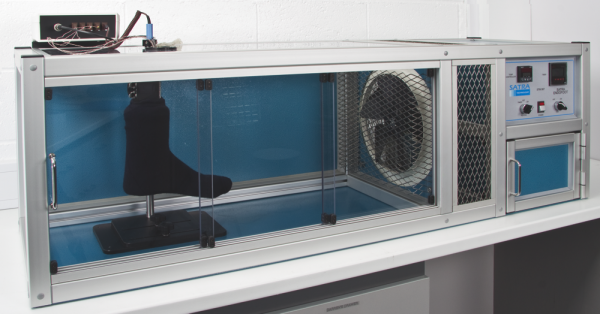 Human subject trials can be conducted in extreme conditions to make a thermal comfort assessment – SATRA has an environmental chamber suitable for human subject trials operating between -40°C and +50°C. However, these human subject trials are costly to run. They require particular care when setting up, and ideally involve several test subjects to limit the influence of the subjective views of any individual participant. Laboratory tests are available to determine the insulation properties of footwear sheet materials – for example, using the ‘Lee’s Disk’ method. While this can help to distinguish differences in the performance between materials, it must be remembered that the level of thermal insulation provided by the complete footwear depends on a number of factors in addition to the materials of construction used. The fit, compression of the insulation, air exchange and constructional details can significantly influence the overall thermal performance of the footwear, so a whole shoe insulation test is required. Some whole shoe tests – such as the European safety footwear test ‘determination of insulation against cold’ (clause 5.13 of EN ISO 20344) – provide little discrimination between footwear types or details of construction and, as a result, cannot be used for product development testing. In order to address limitations in other assessments, SATRA has developed the SATRA TM436:2010 test method – ‘Determination of whole shoe thermal insulation value and cold rating’, which is conducted on the SATRA STM 567 Endofoot test machine. Based on the test results, a thermal resistance ‘R’ value can be calculated for the footwear being assessed. From this value, it is possible to calculate the required temperature gradient between the foot and the external environment, to represent a heat loss equal to the heat generated by a particular user activity level. Varying user activity levels will generate different amounts of heat which need to be dissipated from the footwear. Too little heat loss will result in overheating and sweating, and too much heat loss will result in wearers feeling that their feet are cold. TM436:2010 makes recommendations for three different activity levels – ‘very low’, ‘low-medium’ or ‘high’, with foot heat outputs values (in watts) given for each category. A classification of very low activity level corresponds to sedentary tasks or occasional light work or movement. A low-medium activity level represents walking or light work which can be sustained over a significant time. High activity level represents heavy work, running or climbing – activities that would not be sustainable over lengthy periods. These heat generation values are the values for foot heat loss required to maintain foot thermal comfort. The STM 567 test machine comprises a heated footform which is held at a closely controlled temperature. A skin simulant is placed onto the footform, over which a standard hose is placed followed by the footwear. The footform is suspended in a tunnel chamber within the test machine, through which air is circulated. On commencing a test, heating elements in the footform raise the footwear to the test temperature and then maintain the foot temperature within closely controlled limits. After a period of stabilisation, three consecutive tests are run over prescribed periods of time. The test machine logs the heat input (in watts) by recording the electrical energy input required to maintain the foot temperature for the duration of the test. Footwear with a low insulation value will require more energy input to maintain the foot temperature during the test, as heat is transferred to the footwear and dissipated to the moving air. Higher insulated footwear would require less energy input. From the recorded energy input in watts introduced to the footform during the test, the surface area of the footform (which is a constant) and the temperature gradient while the assessment is taking place, a thermal resistance R value is calculated for the footwear in units of ‘metres squared kelvin per watt’ (m2K/W). An average value for R from the three tests is calculated. The thermal rating for the footwear can now be determined. Using the value of the required heat loss appropriate to a specific activity level, the calculated R value and the known value of the surface area of the footform, the thermal gradient is calculated. As the foot temperature is known, the external environment temperature can be determined. This is the thermal rating for the footwear appropriate to the selected activity level. Although the test is conducted in ambient conditions, this does not affect the calculation of a thermal rating applicable at temperatures well above or below the test laboratory temperature. This is because heat loss or heat gain are dependent on the temperature gradient and not the actual temperature. The sensitivity of the TM436:2010 test allows a thermal resistance R value and associated thermal rating to be determined, clearly distinguishing between footwear types, methods of construction or use – for instance, the effect on thermal performance of alternative linings or combination with different hose can be measured. The second footwear comfort factor which can be evaluated when using the STM 567 Endofoot test machine is moisture management within footwear. While in use, the interior of a shoe is a warm and humid environment, in which moisture is present due to sweat. The response of the footwear to the internal moisture, both long-term and short-term, is a key factor in affecting foot comfort, as well as insulation against cold. Footwear which has the capability of high levels of moisture absorption will aid short-term foot comfort, even if the overall shoe has low permeability. For longer-term comfort, high permeability, together with good absorption and desorption properties, is usually necessary. Maintaining dry hose is a key factor in foot comfort. The thermal performance of the footwear can also be affected by retained moisture. The air pockets, present within most insulating materials, provide a good barrier to heat flow. However, if moisture is absorbed by and retained within insulation materials, these materials can lose a significant percentage of their insulating properties because water is a much better conductor of heat than still air. As a result, managing the moisture within footwear can have an important influence on the maintenance of the overall thermal properties. The SATRA TM376:2009 ‘Advanced moisture management test’ method (AMMT), conducted using SATRA STM 567 Endofoot test machine, allows an assessment to be made of footwear’s moisture management capabilities. In this assessment, a measured amount of water is introduced into the heated footform at a controlled rate via small-bore pipes. This water is exuded onto a thin skin simulant to mimic sweating. The heating system inside the foot causes some of the water to evaporate into water vapour, so with both liquid moisture and water vapour present inside the footwear, the product’s ability to disperse moisture and water away from the foot is realistically challenged. There are four main mechanisms that can contribute to the removal of sweat from the skin of the foot: ‘absorption’, ‘wicking’, ‘permeation’ and ‘ventilation’. The relative contribution of the four different mechanisms depends on the type of materials used, the construction of the footwear and the fitting properties of the footwear. The great advantage of the SATRA TM376:2009 test is that it determines the net result of all four of these moisture disposal mechanisms. Therefore, the results reflect the outcome that might be expected in real wear – hence, the comfort experienced by the wearer. The test is equally applicable to footwear with or without a membrane. All components (hose, footwear and any removable insock) are weighed in a conditioned state at both the start and the end of the test. As the amount of water introduced during the test is accurately known, it is possible to identify where the introduced water has gone, including the amount absorbed into the materials and desorbed (lost to the outside environment). The uptake of water by the sock and insock can be distinguished from water uptake by the footwear. The test is conducted with a controlled airflow through the machine test chamber. Different foot temperatures and sweating rates can be set. The AMMT test should be conducted within a temperature-controlled and humidity-controlled laboratory. A wide variety of footwear types have been tested using the STM 567 Endofoot, including wellington boots, everyday men’s and women’s low heel footwear, military boots, footwear for performance and outdoor applications, sports and training shoes, and industrial and occupational boots. The SATRA STM 567 Endofoot test machine benefits from the integration of SATRA research, design and manufacture, with the test machine developed hand-in-hand with the test methods. Extensive use of the STM 567 machine in our own test laboratories has allowed the versatility of this test machine to be demonstrated and has also provided input for the development of test methods and machines. In addition to testing the footwear’s overall design, materials and construction, the sensitivity of the assessments allows differences in linings, insocks, insulation and hose to be measured. The SATRA TM436:2010 test method (cold rating) is specified in military specifications, and this test is used along with SATRA TM376:2009 for product development and validation of footwear performance. The Endofoot test machine can be provided with a UK size 4, 7 and 9 footform, and work is continuing in the development of children’s footwear sizes. Please email test.equipment@satra.com to discuss how the SATRA Endofoot test machine can be beneficial in the development of your company’s products. This article was originally published on page 32 of the July/August 2014 issue of SATRA Bulletin.